In 2018, Amazon’s dominance in the e-commerce market hit a new milestone. The online retail giant captured 50% of US retail e-commerce with $252 billion in sales. This is certainly a high-water mark for Amazon, but rivals are not standing idly by. Firms in the retail sector are working hard to harness data and digitize their distribution platform to chip away at Amazon’s enormous lead. Companies like Walmart, which now has a partnership with Google, are “testing the notion that an enemy’s enemy is a friend” in a mad-dash to modernize their organizations. These changes span the spectrum of AI capabilities from greater control of data through analytics to autonomous drones that deliver packages. Kroger, JD.com, and Walmart are three companies making a particularly strong move to end Amazon’s digital dominance. Let’s take a look. This goal manifested itself in in-store purchases through the “Scan, Bag, Go” program. Under this program, customers could scan items with their phones as they walk through the store. The app would even notify shoppers if they are near items on their shopping lists. The ability to pay with the phone and never have to wait at a register is the next step in a plan that is increasing the speed and convenience of the Kroger experience. In addition to these experiential improvements, Kroger is planning to install digital price panels to items in their store. This would allow the company to alter prices at a moment’s notice depending on shifts in demand. In a move to improve its business AI, the company has invested heavily in data analytics to greater understand customer behavior. Kroger has changed the food categories in 6% of its stores using a new data-driven mechanism and, according to “The Future of AI in Distribution” article, it “anticipates to do so in 20% to 30% of its stores per year beginning in 2018.” These developments have made Kroger a more viable grocery option in a world of rapidly digitizing retail options. Alibaba holds the title of most famous e-commerce site in China, but JD.com is the strongest and most viable competitor to Amazon in the world’s largest market. The company boasts 500 warehouses totaling 125 million square feet, a fleet of delivery drones that have been running since 2016, and a goal to be 100% automated in the future. It has clearly set its sights on technological advancement. 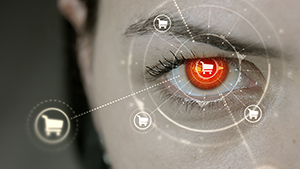 In recent years, it has been developing facial recognition software to employ in all of its brick-and-mortar locations. According to Bernard Marr in an article on Forbes.com, this software would smooth the purchasing process by allowing “shoppers to take their merchandise out of a store without stopping to pay.” A computer would recognize the person when he or she walked in and, by scanning each item on that person’s cell phone and having a payment system connected to the JD.com server, the customer would be able to pay through no effort of their own. This technology, like Kroger’s “Scan, Bag, Go” program, would make the process of getting groceries less of a chore by decreasing the lines and cumbersome scanning process of grocery stores today. Looking towards the future, JD.com is collaborating with Walmart in logistics, marketing, and AI to gain even more control of the Chinese e-commerce market. To do this, Walmart has entered into a series of partnerships or acquisitions that bring it thoroughly into the digital field. Like the partnership with JD.com mentioned above, Walmart partnered with Flipkart Group, the largest e-commerce vendor in India, to get a foothold in a similarly massive market to China. On the technical partnership side, Walmart has joined with Microsoft for AI, machine learning, and cloud capabilities to support the Internet of Things (IoT) venture it has planned with Google. The two giants have partnered to connect the convenience of the Google Home to the vast retail capabilities of Walmart. Speaking with the New York Times, the two sides said the partnership was, “less about how online shopping is done today, but where it is going in the future.” Today, Google Home – and IoT services in general – is still growing, but the benefits for both companies will come when the product is more fully adopted into society. A customer will simply have to speak into his or her Google Home to deliver anything from groceries to a better fitting picture frame, and Walmart will deliver said item to their door. If that doesn’t sound like the Jetsons to you, then I don’t know what will. The combination of these two powerhouses demonstrates the power that Amazon holds as Jeff Bezos’ company already has both of these capabilities in his arsenal. These three companies exemplify a retail landscape scrambling to keep up with Amazon. They are doing so by leaning into AI and data-based insights. Each of these changes is customer-based as they make the retail process simpler or reveal more information to the company about the tastes of their customers. Jeff Bezos’ company is truly a trendsetter by blending e-commerce and retail through IoT devices. For Google and Walmart, this capability is the future and is among a host of automated skills that major retailers are gaining to stay relevant. Teddy is a marketing intern at Dimensional Insight. He is in his senior year at the University of Connecticut where he plays club soccer and writes for The Daily Campus newspaper.